When it comes to customer service, ATi is top notch. In the last few months I have had to RMA at least seven ATi videocards, and the experience has been pretty painless. The problems were noisy or dead fans that had stopped working properly, causing overheating of the GPU, and subsequently artifacts because the problem wasn't noticed quickly. Replacement videocards typically arrived within five business days, which is lightning quick in the world of product RMA's! In the high-end videocard market, the Radeon X800 XL VPU offers great value. Perhaps that's why these cards are selling out everywhere. Today PCStats will be checking out this high-end value king in the form of the ATi Radeon X800 XL PCI Express videocard. The ATI X800 XL is backed by 256MB of GDDR3 memory. A 512MB version is available also, but the extra memory does little in terms of real world performance. Like all other videocards currently on the market, the Radeon X800 XL supports S-Video/Composite TV-out as well as component output for HDTV owners. If you run dual analog monitors, you'll be pleased to know that ATi includes the necessary DVI to analog converter. If you're a dual digital monitor user, you're out of luck. The Radeon X800 XL uses the same reference PCB design as the higher end X800/850 line of videocards do, which shouldn't be a surprise since all the different video cores are closely related. 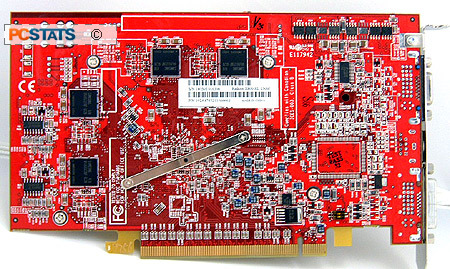 Noticeably missing on the ATi Radeon X800 XL retail card are the four pin front panel video output connector and six pin 12V power connector. Since the X800 XL is built on the smaller 0.11 micron manufacturing process, the videocard can get all its power from the PCI Express x16 slot. The heatsink on the ATi Radeon X800 XL is not quite as impressive as some of the other solutions we've seen recently, but it does the job and is quiet. Made from aluminum, the heatsink comes in contact with both the core and memory on the front of the videocard but there is no additional cooling on the rear memory chips. The 55mm fan is temperature controlled and spins at full speed when the computer boots up, making quite a racket. Thankfully, after system POST the fan quiets down. During testing (and real world use), the fan never spun up to full speed again, even when overclocked. Should you want to use something else to cool this videocard, the two mounting holes around the X800 XL VPU are standard size. That means you can install any of the various GPU/VPU coolers on the market. We are very happy to see that ATi includes all the (non-component) cables necessary to connect the PC to a television. No component cables are included, but since high quality component cables are very expensive ($100+), I wouldn't expect ATi to include them without drastically raising the price of the videocard. Bundled software has never been ATi's strong suit and we've become used to seeing high-end cards come with nothing. 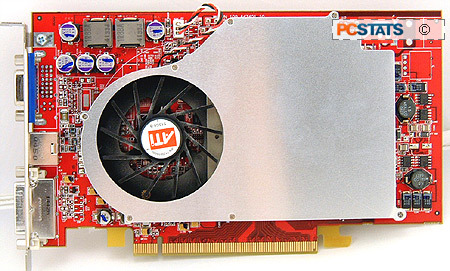 The Radeon 9800XT did come with a Half Life 2 coupon, but that videocard was the exception. ATi's multimedia software is among the best on the market but works only with ATi videocards. At first it would seem like the ATi Radeon X800 XL does not support core temperature monitoring since it's not available in the drivers, but actually you can read the core temps if you use the right program. RivaTuner allows you to monitor the X800 XL VPU's temperature which is a very handy feature.